Here is an 11-minute clip of "Quick Draw McGraw" from 1963 or so..This show was a personal favorite of mine, along with Huckleberry Hound, Yogi Bear and Other Hanna-Barbera favorites during my childhood years..especially 1965-66 when watching these shows during Captain Penny and eventually at 6:30 PM weeknights on WEWS-TV 5. 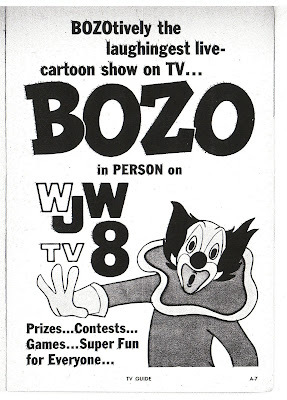 This video includes opening and closing with Kellogg's sponsor tags, A Cocoa Krispies commercial starring Snagglepuss (Daws Butler) and what are called "interstitials",,Bits of comedy with the show's stars in between the cartoons, and a full Snooper and Blabber Cartoon.."Switch Witch" this cartoon first aired September 26, 1959. The clip appears to be from a later rerun..
Warner Home Video owns the rights to Quick Draw along with most other H-B (Hanna-Barbera) properties..Huck and Yogi have already been out on video along with many other lesser shows. Music rights are holding back possible release of Quick Draw..If any HB show needs to be out on video this is the one..
Again from tvnut..Repost Of WKYC-TV sign-off from 1976 with veteran announcer Jay Miltner-He was with WKYC/KYW/WNBK and WTAM before that-From 1948-The mid 1980's at least..Probably the most familiar announcing voice in Cleveland TV History..We see a snippet of the end of "Credo"..WKYC's interfaith "Thought for the day" program which ran from the 60's into the 80's..
From TVNut at Dailymotion..Reports on the WJW-TV 8 changeover to WJKW.April 22, 1977..Incidentally..31 years ago yesterday..This replaces an earlier YouTube post.. I have mentioned in the past about an application/site called sitemeter.com that tracks some information about who visits the blog at any given time..There was, I thought a strange anomaly on the blog this morning between 4-5 AM..according to sitemeter, there were 218 visits on the blog, when generally after 1AM traffic drops off to almost nothing till 6AM the next day..In researching the visits, the vast majority of visits came from Wisconsin, particularly the Stevens Point area..And most of the visits were from various Google searches revolving around NBC, September 24, 1961 and cartoons. What I am asking is if anyone that was here between 4-5 AM would comment or email me..I am just curious as to why this happened..Thanks.. Today i want to give a brief mention to a "Lost Station"..WCOM-TV Channel 68 in Mansfield, Ohio..First on the air as WCEO-TV in January 1986, The call letters were changed to WCOM-TV in July 1987..My brother had a Tall TV antenna tower at his home outside East Sparta, Ohio where I saw a snowy, but watchable picture on Channel 68..The channel 68 Owners were shooting for must carry in the Columbus Cable TV Market by putting a high antenna south of Mansfield..But the Columbus Cable Systems refused to carry WCEO/WCOM..So the station went dark in 1989..as WCOM-TV it carried shows like American Bandstand, Battlestar Galactica and Hardcastle and McCormick, as well as movies..Here are a few YouTube snippets from WCOM-68, courtesy colimbusmediatalk.. Promotional Theme..I know the video isnt real good but I like the theme..
TV 68 Sign-off..with various images from around the Mansfield area..
As we see from these clips, The station made a good effort in programming and imaging, etc..Apparently, without the Columbus Market, they were'nt going to make it or so they felt..hence the station went under..
Channel 68 returned in June, 1992 as WMFD-TV..Concentrating entirely on the Mansfield/Richland County Market with News, local live sports and some syndicated programming..Owned by Mid-State Television, they also operate WOHZ-LP-50 in Mansfield, Ohio..WMFD-TV's Digital tranmitter is on channel 12. Some information courtesy Wikipedia..The WCOM Clips were probably recorded aways from Mansield, which is why the picture quality is as it is..Still a neat historical curiosity. Peanuts Characters on "The Ford Show"
Something really cute I just found on YouTube:The opening to "The Ford Show starring Tennessee Ernie Ford" from probably the late 1950's..Charlie Brown and Linus are trying to "class up" the opening by using a recording and Charlie Brown lip-syncing..But the record skips! The "deeper" Charlie Brown voice appears to be that of veteran voice actor Paul Frees..Feel free to correct me if i'm wrong..Great Fun! This would have been about five years before "Charlie Brown Christmas" The Peanuts characters were used to sell Ford cars at this time..Thanks to weenielongus for the clip.. But had not gotten around to linking to them.. The third new link is "Billy Ingram's TV Party" probably one of the oldest TV history sites on the net..A very colorful (some would say cheesy) look into TV's Past..But really fun and addictive..Hundreds of articles..some on subjects one wouldnt normally think about when it comes to classic TV..Lots of video and audio clips..There is also "TV Party Plus" where, for a nominal fee ($5.00 for 2 months) one can access his entire collection of articles and rare video/audio..Though there is plenty to check out even without the fee..I highly recommend all three sites..Large thanks to Billy Ingram for linking Cleveland Classic Media to his site..
Gib Shanley with Jim Graner, KYW/WKYC-3 Sports anchor..Another Class act..The two worked on the Cleveland Browns Radio broadcasts from 1961-74..Graner passed away in 1975. Shanley also hosted "Quarterback Club", The Browns weekly Highlight show on WEWS-5. 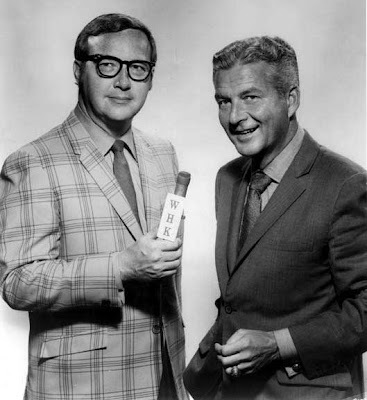 Gib with TV-5 weatherman Don Webster..They were always poking fun at one another..
Cleveland Sportscaster Gib Shanley passed away late yesterday afternoon following complications from pneumonia..He was 76. He came to Cleveland in 1961 as play by play voice of the NFL Cleveland Browns,,Calling, with Jim Graner the last major Cleveland pro sports championship in 1964..He worked for a time as sports anchor at KYW-TV 3 before landing at WEWS-TV 5 where he would be lead sports anchor until 1984..After a couple years in California, Gib returned to Cleveland at WUAB-TV's "Ten O Clock News" as Sports Director from 1988-96..He then returned to Channel 5, doing sports commentary. His biggest controversy, however, had nothing to do with sports..He burned an Iranian flag during a sportscast in 1979 in protest of The Iran hostage situation at the time..While station executives were'nt pleased, Gib became a hero to many around the country for standing up for the US..even in a small way..
Gib was known for his class, and unflinching honesty when it came to the sports teams..He told it like it was, even when the teams were not so good, but he also had a dry wit, which made what he said easier to take..Gib was also known for helping young talent..Many of today's sports anchors in Cleveland looked to Gib as a mentor and role model..He was also respectful to the print media, even in smaller markets, where he would always lend a hand if a media member needed help with a Browns story.. It seems the legends are all leaving us way too soon..Prayers go out to his family and friends..
Miss Gloria Brown..Hostess for a 5-minute program daily at 10:25AM..Following Tom Haley's "Cash On The Line" movie at 9AM. 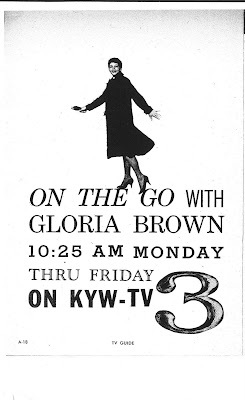 Gloria Brown isnt as well known today, but she was on WNBK-TV/KYW and WTAM-1100 Through most of the 1950's..With co-hostess Mildred Funnell, She hosted "Mildred and Gloria" and "Idea Shop" on WNBK/4 through the mid 1950's. Seems Ms Brown was TV 3's answer to WEWS-TV's Paige Palmer..I have heard she is still living in the Cleveland area today.. 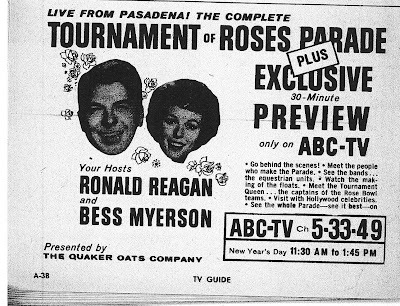 Ad for The Bozo show on WJW-TV 8Saturday mornings 9-10AM..Including Bozo Cartoons..
TV Guide Ad for ABC's Coverage of the 1960 Tournament of Roses Parade...With hosts Bess Myerson and Ronald Reagan. Incidentally, The Grand Marshal of the parade in 1960 was Vice President Richard M. Nixon..
March 28, 2008 marked the first anniversary of Cleveland Classic Media..I had no idea how, or even if this would be accepted when we first started this..It has gone way beyond what I thought it would at first...It honestly amazes me at how much people have enjoyed the blog. The site has grown from an average of 60 visitors a day to over 100 nearly every day, from all over the United States and many parts of the world..The most readers have come from the Northeast Ohio area, of course.. I feel this area has the most extensive Broadcasting heritage..and that is what I want to bring out..I appreciate any comments and all the feedback via email,,It also has been neat to learn different ways of posting things. When we first started, I had no idea how to use a Scanner or how to post video..It has been neat to learn those things and am trying to do more to keep the posts interesting..Thanks to all for your support and comments..
8-27 Eyewitness to History-SPECIAL-Walter Cronkite-Review of 1959 events. 8-27 Person to Person-Charles Collingwood-Guest Maurice Chevalier. Interesting to note:The previous night (New Years Eve) Rex Humbard Televised his New Year's Eve Service-Live-From 1AM-7:45AM-Six hours and 45 minutes-on WJW-TV Channel 8..Very unusual for that period..for any station to be on all night-for any reason..